This is turning out to be a good year for Indian fashion! Rahul Mishra and his historic Woolmark Prize, Wendell Rodricks’ well-deserved Padmashri, and a beautiful fresh Lakmé Fashion Week (LFW) have all made me rather happy. There was a freshness and lightness at many of the LFW shows. I enjoyed sitting and applauding another immaculate Sailex collection with the electrifying Monica Dogra on my left and the bubbly Sona Mohapatra on my right, and ordering for next season at The Source from designers like Ragini Ahuja. I made punny jokes, pun after pun- other, with Ash Chandler while he burnt the candle at both ends before wife Junelia Aguiar’s polished debut. Geetu Hinduja’s energetic live performance for Anita Dongre and Delna Mody’s booming opera singing down the ramp for Ashdeen were as pleasurable as the garments themselves. (Ashdeen’s exquisite, embroidered peacock sari – so fabulous! Sigh.) The giant alien spaceship that hovered over Gaurav Gupta’s futuristic drapes and Mawi’s to-die-for jewels is still on my mind for its fun quotient. Even the showstoppers felt like fun this time round. The adorably shy Adhuna Bhabani-Akhtar for Asmita Marwa, Kirron Kher for Gaurang, and real-world folk like Kunal Lodha for 11.11. Seeing Sneha Arora’s indigo droplet garments, Manish Malhotra’s cheery floral prints, the tribal inspired soft linens from Anavila, and Huemn’s take on sporty luxe with fun #selfie T-shirts made me very happy too. Have I been overdosing on Pharell – with all this happiness? So what? It’s working. Hush. Don’t be a downer! Sreejith Jeevan’s Rouka label that made its Gen Next debut put an even wider smile on my face. Sreejith has trained in Paris and at NID, and he currently operates out of Kochi. I loved his confidence and how immaculate everything was at his debut – from look book to stall decorations, to fashion film – every detail in this Weather Forecast collection was spot on and contributed to the narrative thread. His delicate, woven, layered garments evoked the rain, with their paper boats, cycle and umbrella motifs, and in Sreejith’s fashion video especially, memory and sound collided poignantly. I could almost smell the earth and feel the puddles with the experience. This is what good fashion does – it transports you. Similarly, Rajesh Pratap Singh’s exquisite, out-of-this-world, shiny,‘metal’ garments, enhanced by Sumant Jayakrishnan’s candle-lit, mirrored ramp, outdoor set with UV lights and fireworks, and the maze we had to go through to reach their secret garden, hit all the right notes at the grand finale. As the show ended, I wondered: was it a collective dream that we just witnessed? I didn’t want to wake up. Pratap had created fashion that inspires, that elevates the soul and makes you want to touch perfection. Hats off yet again to Purnima Lamba of Lakmé and Saket, Gautam and their tireless team at IMG-Reliance. They’ve managed to keep LFW on the bleeding edge. One area where they’ve really shone has been in propelling LFW into the digital and social media realms. This season at LFW, digital pervaded everything – the ramp, the sponsor lounges, the waiting areas, live Google hangouts with Miss Malini…. I couldn’t walk a few steps without passing by a Tweet Wall, or being asked for an Instagram pose or a video byte. Chatting with Saket post the ￼￼grand finale, I was blown away by the numbers he shared. He told me that this year’s LFW trended at Number 1 internationally on Google+ for two days. The season had 45 shows that were live streamed on YouTube, and their channel had nearly a million views. Over 70,000 pictures were uploaded straight from the venue during the course of the week, including over 5000 #Autoawesome ‘selfies’. LFW also trended at Number 1 internationally on Vine, a platform on which it made its debut this year. This was LFW’s second season on Instagram, and here, more than 10,000 pictures were posted with #lakmefashionweek in these five days. Their Facebook community increased by 45 per cent from three lakh members to 4.4 lakh members in just the five days of the event. And on Twitter, there were more than 25,000 LFW related tweets generated over the five days. These are incredible statistics and what they tell us is that we in India are as good as, if not better, than any other global fashion week in democratising fashion digitally – taking it out of the small everyone-knows-everyone world of the ramp show to a much wider audience worldwide. But LFW’s audience widening efforts weren’t just happening online. I was proud to be a collaborator at one of the offline events – a textile panel, and there were many other such events – fashion film screenings, makeover classes and more…but let me tell you a bit about my panel for now. This season, we decided to have a conversation on how we can make textiles cool for young India. I had curated a range of panelists for this special LFW Friday Funda – including actor Kalki Koechlin, A Small World CEO, Sabine Heller, hemp farmer, Sanvar Oberoi, Bungalow 8’s Maithili Ahluwalia, designer Payal Khandwala and Dinesh Singh, the Additional Development Commissioner (Handlooms) from India’s Ministry of Textiles. The idea was to assemble different stakeholders, each of whom is working with textile promotion in a different way from the other and share experiences and perspectives. It was a robust discussion. Kalki has freely given her time and resources to working on projects featuring fabrics like Banaras kora silk. (Check out her recent shoot done for the Pallavi Style Diaries blog.) It was inspiring to hear of how Kalki grew up as a fusion of multiple cultures and is very conscious of environmental sustainability and how both these factors play a role in her sartorial choices, and her gravitation towards Indian textiles. Maithili Ahluwalia spoke about her own hybridity while growing up, and how, in the context of textiles, she finds it difficult to be boxed into categories like preservationist or modernist, craftsman or designer, past or present, artisanship or technology. She told us that she founded Bungalow 8 to be at the meeting point of grassroots and glamour, craft and couture, East and West, local and global. Sabine Heller spoke of hybridity too, and how, for an Indian textile revival globally, we need to focus on compelling stories and amplify these within the public domain. Sanvar Oberoi, who works with industrial cannabis to create handmade hemp textiles, echoed Sabine’s need for an emotional connect. Sanvar sells his Nirbhaya textiles with little notes made from the artisans who wove them, thereby adding a personal touch to the textile story for the wearer. Payal Khandwala spoke about the beauty of working with the imperfections of hand-woven textiles and how consumers need to be educated about the luxury of these. I have loved her special woven silk fabrics from Phulia as well as her format innovations like the deconstructed sari, and she spoke on the panel about how we need to get out of a ‘traditional’ mindset while thinking of textiles and instead think of new shapes like the gown. Dinesh Singh spoke about various initiatives the government was taking including geographical copyright of fabrics, and a wider outreach to designers. He mentioned that about 43 lakh people are employed by the handloom sector and the government was working hard to ensure that their craft sustains and flourishes in the future. But more than what was said on stage, it was great seeing the audience that had come out in such huge numbers for this talk and that was happy to stand and watch when the seats ran out. It included a large number of students as well as fashion editors and writers such as Anaita Shroff Adajania, Shefalee Vasudev and Ekta Rajani, and it was a meaningful experience to ideate across boundaries with all of them. Hopefully the momentum and links we generated on that day will contribute in creating a better future for our country’s textile heritage. Speaking of momentum and links, I was excited to attend the Mumbai Mantra – Sundance Institute Screenwriters Lab brunch last month that was hosted by Anand Mahindra and Rohit Khattar. One of the most important aspects of a film is writing, and in Indian cinema, it seems to be the most neglected. Each year, this Lab selects young screenwriters that are then closely mentored by Sundance’s elite panel of professional screenwriters, so that they can further their craft and take it to a wider global audience. As Rohit told us all at the event, we are at an exciting storytelling stage for independent cinema in India. More power to such catalytic efforts for our country! It was a strong woman-oriented March for me, overall. I had the opportunity to speak at India’s first ever INK Women Conference, held in collaboration with the Indian Merchants Chamber Women’s Wing at the NCPA in Mumbai. It was a very moving day curated by Lakshmi Pratury and the INK team. During my talk, I interspersed my journey of articulation of my own LBGT identity against the recent developments in India, especially with regard to the Supreme Court verdict on section 377, and argued about why I’m optimistic about the future, despite the recent court setback. Among the other speakers, I was awestruck by Sabriye Tenberken who lost her sight at the age of 12, but not her love for travel. Among Sabriye’s accomplishments are starting a school for the blind in Tibet, and Kanthari, her new centre in Kerala, that is named after a small spicy Kerala chilli. If you go visit them in Kerala, Tenberken’s students will ask you to bite into a Kanthari to see how a small chili can make a big difference! Screenwriter and director Megha Ramaswamy who is currently working on a film called Newborns, based on the theme of acid violence, noted that 90 per cent of such cases were against women. Megha brought acid attack survivor Nasreen with her from Delhi, and Nasreen showed great courage by removing her scarf, unveiling herself for the first time since the incident. I was part of a group of three men who were giving talks at INK Women. The other two were Arunachalam Muruganantham (India’s sanitary napkin superhero) and Sunil Khandbahale (whose online dictionary is empowering millions across the world). Truly, gender is a construct and the best kind of men are those like Sunil and Arunachalam who are sensitive and inclusive to both men and women in their lives. During the conference, I loved hanging out with women visionaries like anti-trafficking crusader Sunita Krishnan, being charged by the music of Shankar Tucker and witnessing the strong women power dance by Shiamak Davar’s company. A personal highlight for me was dancing with Robin Chaurasiya’s Kranti-karis up on the NCPA stage while the legendary Usha Uthup boomed ‘Hari Om Hari’ live, right next to us! Some days after INK Women, I went to see Poorna Jagannathan’s Nirbhaya which she brought to India after its Edinburgh Fringe Festival acclaim. Social media played an important role in Nirbhaya coming to India – Poorna’s successful Kickstarter campaign had raised a substantial component of the budget needed to conduct the India tour. It was a moving and disturbing watch. 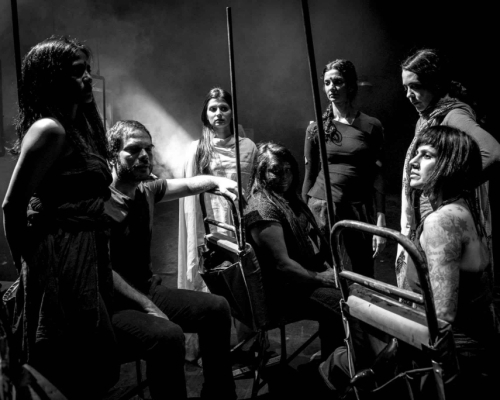 Personal testimonials from the actors including Sapna Bhavnani and Sneha Javale were woven into the script by internationally acclaimed playwright and director Yael Farber, and Mumbai gave it a standing ovation as did all the other cities that it toured. Now if only someone could do something about those cellphones that kept on going off in the audience, at key moments. Nirbhaya is indeed about breaking silence, but not with your cellphone ringing! By far the most uplifting example of woman power I encountered last month was Kangna Ranaut’s performance in Queen. I still smile each time I think of the film. What a simple, powerful, journey of articulation and self-discovery! What a strong feminist message couched in feather light comedy! And what beautiful small details to complete the picture! Everything in Queen, from the casting (Rajkumar Rao and Lisa Haydon, both perfect picks), to the clothes, to the camera work, to the music and moving lyrics is spot-on. The sweaters worn during the mehendi dance, the tiny hotel rooms in Paris to which you have to drag your suitcase yourself because there is no elevator, each scene and each dialogue rang authentic as the movie unfolded. Whether it was in dealing with sexuality, understanding the complex nature of parenting, exploring multiple facets of friendship, or most importantly, one’s own relationship to one’s own self, this Rani served as our national therapist the past month. Of course we all saw Queen being completely aware of Kangna’s own story and struggle as a small-town girl from Himachal Pradesh in the big bad world of Bollywood, and throughout the film, we cheered for Rani as much as we did for Kangna. Hats off, Queen Kangna, and take a bow. For you now, not just London, but poora world thumakda!